I haven’t posted a Sunday rant in quite a while. Truth be told, it’s been a couple of years. Many of my followers probably don’t even know that this type of post used to be a weekly event. I titled my Sunday posts, “Sunday wrap up” or “Sunday Rant”, depending on the topic and my mood. I’d look at the past week’s news and give my thoughts, or I’d post about something that really ticked me off. I stopped posting these not because my dear Readers didn’t like them, but because I notice as I age, I don’t give much energy to negativity: in myself, or world events. I hope this means I’ll be a laid-back old lady who wears funny hats, not a bitter old woman who always wears a frown. As much as I like to think I can usually roll with the punches or at least just sigh softly when annoyed, today is not one of those days. Today, I feel it necessary to rant. My weekend mood did not start out like this. I had high hopes for a very blissful, quiet weekend. It’s been raining off and on for the last few days and the weekend forecast called the same. There is nothing I like more than a rainy weekend cuddled up on the couch with a book. As a reader, I’m sure you can relate, and as a reader you probably have a specific book in mind when you plan for this kind of weekend getaway. I usually do. My son gave me a Barns and Noble gift card for Mother’s Day. I was so thrilled with the idea of ordering books off my wish list that I jumped online that very night. I picked out the second book of The Science of Discworld series and Doctor Who: The Shakespeare Notebook. Imagine, all four of my favorite subjects: science, the Discworld, Shakespeare, and Doctor Who, mashed together and available for my rainy weekend enjoyment. I would need this distraction after my long workweek. One of my co-workers went on holiday and it was up to me to do both of our jobs, including dealing with the public, and forgoing my lunch breaks as no one offered to back me up. On top of this I was just beginning to learn a new software system only to find out that what we had was outdated. The new system was loaded up and it fell to me to learn it from scratch; no one else had a clue how to use it. By Friday I was mentally exhausted and looked forward to doing nothing more than moving from the bed to the couch. But, there was a problem. The books I had ordered from Barns and Noble hadn’t shown up yet. Mind you, the depository is only 11 miles from my house. Where the hell were my books? A few years ago this wouldn’t have been an issue. I remember wondering if Barns and Noble had some how hacked into my computer because I’d come home a day after placing an order to find a box waiting for me. Sometimes I’d receive my books having ordered them the night before! Surely they shouldn’t be taking five days to go 11 miles. Friday morning I got online to track my order. Perhaps my books had to come from a different depository, one across the country? Nope, as you can see from the screen shot, (taken this morning with updated information) the books originated in Reno but for some inexplicable reason, went from there to California and back again in one day! 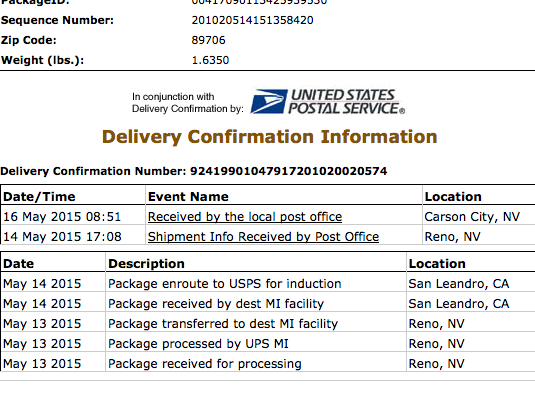 It took another whole day to get from Reno to Carson City, which are only a few miles apart. Let that sink in. It took less than 24 hours to get from one state to another and back again, yet took longer to travel interstate. On top of this cluster, the books were originally shipped UPS, yet on day two they were given to the US Postal Service for delivery. Okay, I thought, don’t get upset, as of Friday morning Reno has my books. With luck I’ll have them Saturday. No worries. In all honesty, I had a few things I had to do Saturday morning anyway. I got up early Saturday and spent the morning working on a side job in between washing and folding laundry. Surly by the time I was done my books would have arrived and I could disappear from this world into Terry Pratchett’s. With luck, I’d be visiting Shakespeare with Doctor Who on Sunday. But no, it was not to be. When I checked the mail I was surprised to see a small package, but not my books. The small package contained a plastic cover for my new iPhone. I ordered this on Mother’s Day around the same time I ordered my books. I didn’t expect to see the cover for at least two weeks, given that I ordered it from an Amazon 3rd party vendor who said their shipments take up to two weeks. Not only did it arrive early, it came all the way from Florida! For those of you who are not familiar with the U.S., Florida is about as far from Nevada as it gets. It is on the far side of the East Coast, while I sit just four hours away from the Pacific Ocean. By this time I was livid. I expressed my displeasure with B&N via Twitter. To their credit they responded rather quickly with a request that I send them my order number so that they could look into the issue. The next response was baffling. They told me, “It shipped on the 13th, and would take 3 working days to get to me. I should see it on the 18th”. I am not good at math, but if the 13th counts as the first shipping day, wouldn’t the 15th be the third? And, since the Post Office is open on Saturdays, making it a workday for them, wouldn’t the 16th count if the 13th didn’t? There was no response to my question. As far as they are concerned this is a non-issue. Well, I have news for you Barns and Noble; I am going to make this a non-issue by never ordering from your online store again. If you don’t what I want in stock, I will order from Amazon, even if I have to order from a third party vendor. They at least know how to ship a proper package. Yes, I am aware this is a first-world problem and yes, I am aware this is not much of a problem at all. But given that other bookstores are trying to compete with Amazon, you would think that B&N would do everything in their power to ensure “expedited” (their words not mine) shipping. I know they can do it because they used to offer better service than Amazon. Thinking about carbon footprints of these two books makes me ill. And, I would at least expect a better response from the company who is only 11 miles from my house. Thanks for letting me rant. Now, back to wearing funny hats. My problem is rarely with the source; it’s usually with whichever company ends up delivering it. I remember waiting all day once to get a replacement cell phone, a matter that was time-critical. I checked the tracking on the hour, sometimes more frequently. So it was an ugly surprise to look up the tracking info at 4:30 PM and find it was listed as delivered and signed for. Hey, what? I’m HERE, you jerks! And I’ve not seen it. You cannot have delivered it to me, period. You cannot even have tried!! Well, as it turned out, they hadn’t even bothered to come to our door, just knocked on our neighbor’s door and had him sign for it. Excuse that makes this BARELY acceptable: our house is behind his. Fact that makes that excuse unacceptable: there’s a sign clearly pointing to our house with its street number, and the place is painted a distinctive color so you KNOW it’s not part of any other house around. Rant, rant rant, RANT, RANT! Rant on my friend! That’s what this post is for. I’d rant to if this happened to me. What right did the driver have to drop it off with someone else? I hope the company looked into this. I wouldn’t be so upset with B&N if they had really looked into why the books traveled so far and why they went from UPS to USPO. All I can hope is that it rains next weekend. Unfortunately with nary a bookstore in sight, I often order online. And while I will gladly admit to having plenty of books in the house yet to to read, I was in the mood to enter the Discworld. Good thing another weekend is just around the corner. I hadn’t forgotten you were, are, ill served by real world bookstores, and completely understand your additional frustration with one virtual world outlet.